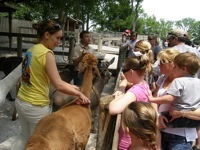 SPANISH-TV and the Nashville Zoo will host "Latino Day at the Zoo" on Sunday, June 1 from 9:30 a.m. to 4 p.m. This is one of two events at the Zoo this year that will cater to Nashville's Hispanic fans of fauna. The other event is called Dia Familiar at Nashville Zoo and will be part of Conexion Americas' Hispanic Heritage Month celebration in September. Nashville Zoo and SPANISH-TV present the first Latino Day at the Zoo on Sunday, June 1. Activities will run from 9:30 a.m. – 4 p.m., and SPANISH-TV hosts Sheyla Paz Hicks, Raul López, Karina Camilo and Alexis Martinez will be at the Zoo meeting guests. Hyacinth Macaws: 9:30 a.m. – 10:30 a.m.
Giraffes: 10 a.m. – 11 a.m.
Gibbons: Noon – 1 p.m.
Bengal Tigers: 2 – 3 p.m. Discounted admission coupons for Latino Day can be picked up at La Reyna Supermercado 1 & 2, Las Cazuelas Mexican Grill, La Hacienda Mexican Restaurant, Azeca Restaurant, Los Arcos, Jalisco Market, Periodico Latino Newspaper, La Campana Newspaper, Latina 900 AM and La Ley 1380 AM. Latino Day at the Zoo is the result of a partnership between Nashville Zoo and SPANISH-TV. SPANISH-TV launched in 2006 and airs on Telemundo Nashville, Middle Tennessee’s sole Spanish-speaking network. For more information about SPANISH-TV, visit spanish-tvtucanal.com. Photo by Jeffrey Peeden. Licensed under Creative Commons.